First of all, feel free to educate me on the species of wood I have here. Well, I had to be back to the church in an hour to help prepare for some renovation we are having done so I decided to take a quick trip home. Well, I pulled in to my regular dumpster check. This particular dumpster is one of the long ones. It even has an awning over it. At first I did not see much worth jumping in for. Down at the far end though, I saw a board or two peeking out so I jumped in. 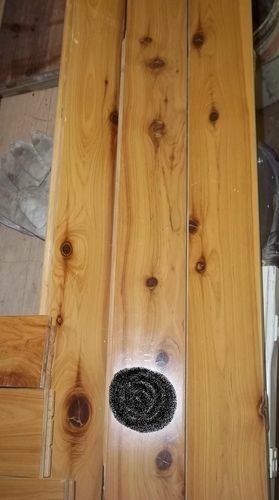 I trapsed to the other end, climbing over carpet rolls, carpet padding, and reached a place with a few boards showing. The boards were not on top like I would prefer. I fished for a few boards to get a feel for whether it is worth moving things for. ...and the TS insert looks none too happy about the prospect of having to rip this stuff. The back side of these is a bit different, but will still have to planed down from their current 3/4” thickness. After planing, I should easilly get 5/8 of material. 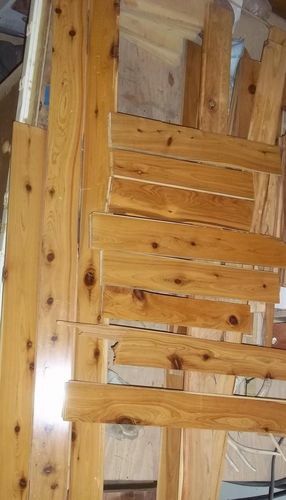 The only down side from what I’ve seen is that this wood seems pretty brittle. I am somewhat cautious as to how this wood will act when milling. As I stated in the beginning, I would like to know what wood I have here. Looks like a NICE SCORE!! 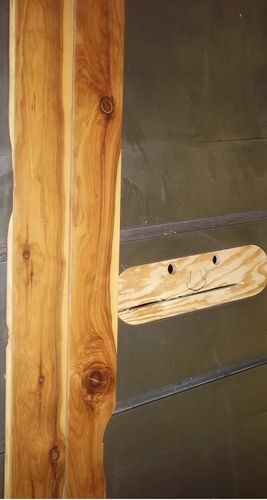 Joe, I can safely rule out Knotty Pine. This is a little hard for Pine. Same for Cedar. After contemplating about the brittleness/splinteryness of this with a recent bout with some routing on another find, could this be Hickory? I have no idea what Hickory is supposed to look like. Nice find with a bit of work. It is a flooring company in Fredericksburg. Not worth your drive from Md. :) Try scouting out a flooring company near you and check it often. When they rip out old flooring, they have to dump it somewhere. I’ve gotten to where I just bypass it now if it is Oak. Oak is the new Plastic. OnlyJustME, I love your kid’s shirt on your avatar. I would go for Cypress… Marcrocarpus…. I think it is Cypress! When you start planing it down you should be able to tell though! 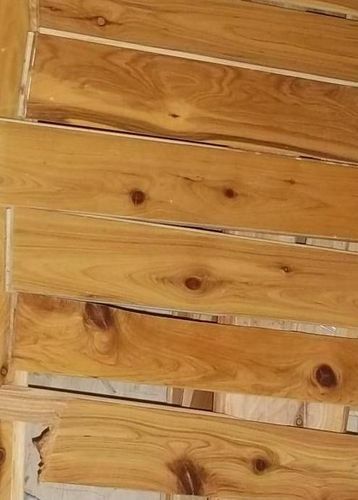 and ASK THEM “What kind of wood is this?”. Yeah Joe, that’s the best solution. 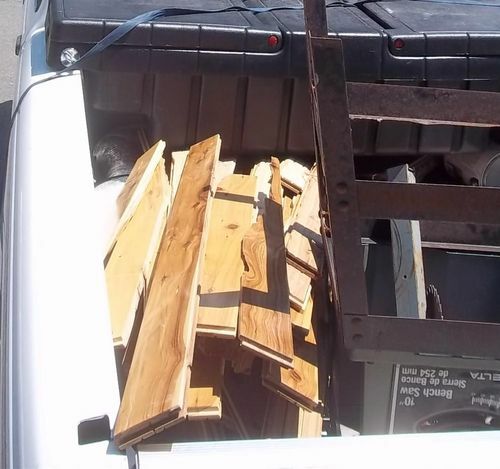 I say hickory – our first house had a floor made of hickory and cabinets to match.. 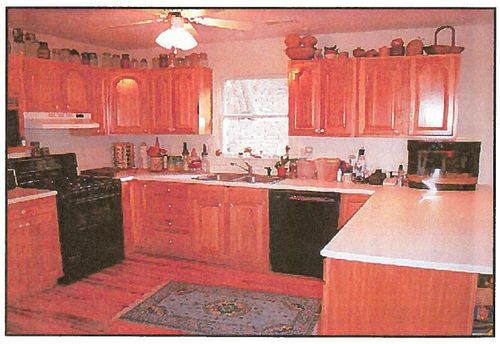 I know the pic doesn’t do justice to it – it is a scan from the realtor brochure – but the knotty pattern as well as grain and hardness match what i remember of our flooring. The cabinets were largely clear of knots – - the flooring was not. 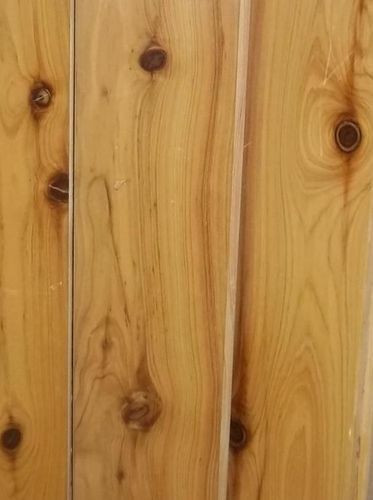 i do believe its hickory …. nice score. If it is hickory it should be pretty tough on your blades and knives. So who do i place my bet with? I still think australian cypress. Are you going to find out from the flooring place? I need to know. 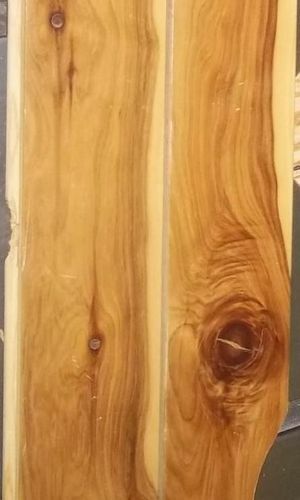 Hickory, Cypress or douglas fir..
Looks a lot like hickory or pecan to me. If it’s that prefinished flooring do not run the finished side through the planer! It will kill blades very quickly. I use the drum sander with some 50 grit to get the finish off. Nice score! Glad to see you’re into dumpster diving and not too proud to admit it. I’m a charter member of “Dumpster Divers”.